The longwave transmitter at Zehlendorf 40 kilometres north of Berlin on 177 kHz was switched off for good on December 31, 2014. 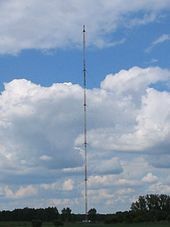 With a power of 500 kilowatts, the transmitter was well heard in Norway. During the last years of service, the transmitter carried programming from Deutschlandradio Kultur. I sent a reception report to Deutschlandradio Kultur in March 2014 and waited almost one year before a reply in the form of a full detailed QSL-card arrived in my mailbox. This was for a reception made at Lista in January 2014.